Exploring the WLT Chelsea Exhibit at Chester Zoo. 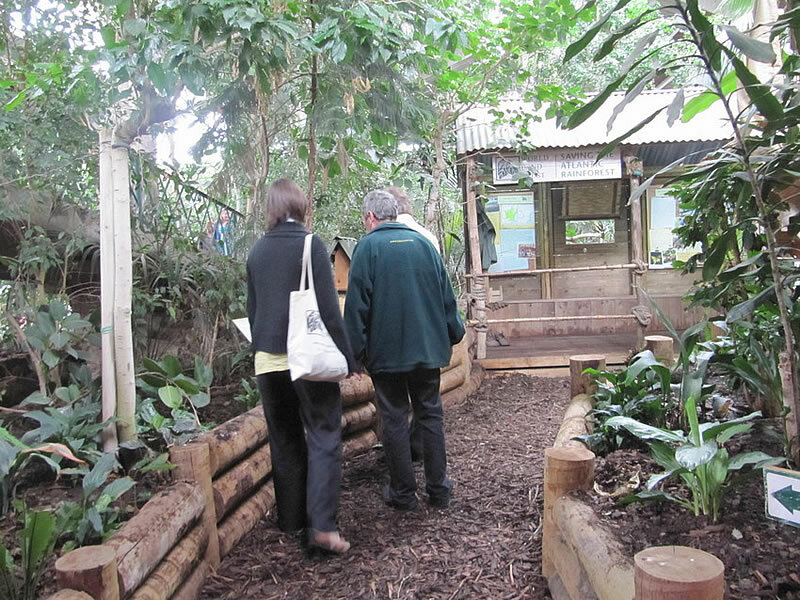 On a recent visit to Chester Zoo, staff from World Land Trust (WLT) had the opportunity to see the award-winning exhibit from the RHS Chelsea Flower Show 2010 in its new home in the zoo’s Tropical Realm. The exhibit not only showcases the beauty of the Atlantic Rainforest, but also raises awareness about the need to conserve this critically threatened habitat. Mark Sparrow, Curator of Horticulture and Botany at Chester Zoo, had helped create the WLT exhibit by loaning to the exhibit a selection of flowering orchids from part of the National Collection housed at the zoo. Among the orchids loaned were some of the rare and endemic species of the Atlantic Rainforest. Once Mark saw the completed exhibit he was determined that it should have a ‘life after Chelsea’. 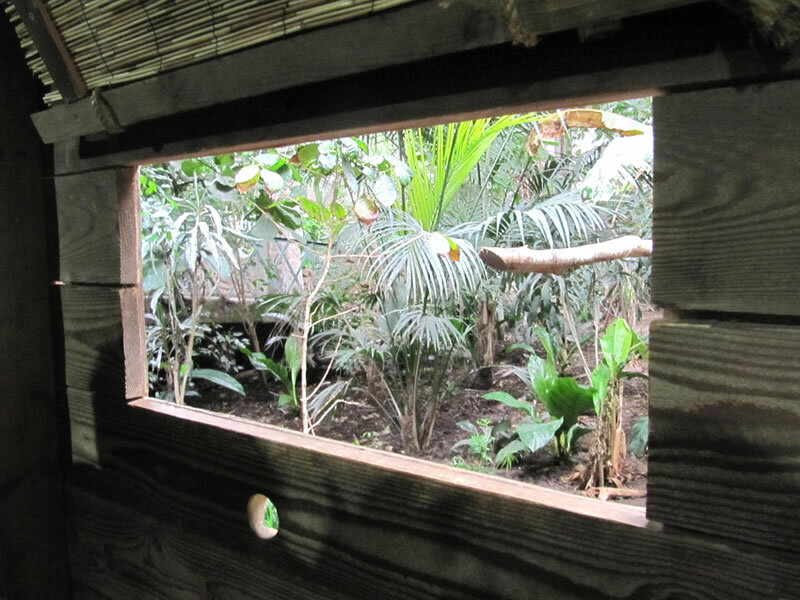 He organised for the Rangers Hut and garden to be transported to Chester where it has been stunningly recreated in the Tropical Realm – despite the best efforts of the Victoria Crowned Pigeon who decided to nest on the very spot where the exhibit was to be rebuilt. The chick of this, the largest pigeon species in the world, found only in New Guinea, successfully fledged and building could then commence. The window of the ranger hut displayed the REGUA webcam at Chelsea. Now the window looks out over the rest of the Tropical Realm. Largely inspired by his involvement with WLT’s RHS Chelsea Flower show exhibit, Mark Sparrow visited Reserva Ecológica de Guapi Assu (REGUA) in April 2011. The aim of the field trip was to establish how the zoo could link their orchid collection with threatened orchid conservation in the wild, one of Chester Zoo’s many ongoing conservation projects. 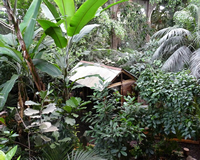 As part of their commitment to the conservation of this orchid habitat, Chester Zoo is supporting a ranger at REGUA for 2011. Without the dedication of reserve rangers, protecting threatened habitat and wildlife would be impossible. John Burton (WLT CEO) was so impressed by his visit to the zoo and their commitment to conservation that he blogged about it in his Green Diary.